Abaddon’s Eve is the last book I finished (Goodreads says I completed it on August 6th). Here’s what I thought of it. Rechab and Alack, young people on the cusp of adulthood, have no idea how drastically their lives are about to change. Alack wrestles with his genuine but impossible love for Rechab, while Rechab does her best to shield her heart from her imminent and permanent separation from her childhood friend. Their parting occurs far differently than either expected. Kol Abaddon, the crazy prophet from the wilderness, comes to Bethabara preaching destruction on The People of the Great God. When Alack catches a glimpse of the vision, he follows the prophet into the desert to begin his training as a prophet of the Great God. At the same time, Rechab finds an unlikely friend in Flora, a wealthy woman considered to be unlucky. When a foaming servant declares that Rechab is marked for service to a false god, she flees Bethabara with Flora’s retinue. Neither Rechab nor Alack truly know the Great God they now serve, but their journeys will bring them closer to Him. I really enjoyed this story and look forward to the next book. 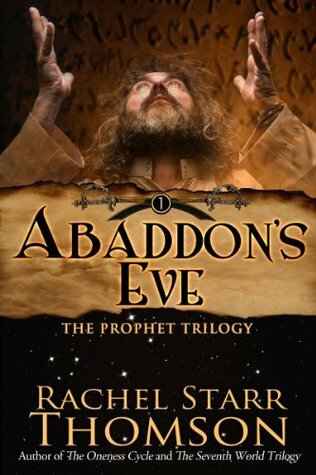 Anyone who has enjoyed Prophet by R.J. Larson will most certainly like Abaddon’s Eve as well. Though not one of two focal characters, my favorite character in this story is Flora (the rich woman who befriends Rechab). She is introduced as a powerful, smart, savvy woman, but her vulnerability unfurls with the story. She is a seeker, a lover of God who fears she cannot be fully accepted by Him because she is not of The People. She’s a flawed character with great strengths and a beautiful heart. I can’t wait to see where this journey brings all of the characters. I read Abaddon’s Eve on my Kindle, so I can lend it to anyone else who has a kindle or kindle app. If you would like to borrow it for 14 days, just leave a comment, and I’ll pick one of you to lend it to. Also, Prophet is still free for Kindle. If you haven’t read it yet, go for it while it’s still free. I am new to your blog, and have found it very helpful. I am an avid reader and am always looking for good fiction books that draw me and others closer to the Lord. I would love to get to read Abaddon’s Eve, it looks like a wonderful book! From your recommendation I have read the whole “”The Infinite” series by R.J. Larson, and loved the books. I am not sure how the lending works on a kindle, but I do have one. Thank you for posting and I am praying for your book Counted Worthy. I’m so glad you’re enjoying the blog, Michailia. And I’m pleased to announce that you’ll be the one to borrow Abaddon’s Eve. Please let us know if you enjoy it! Abaddon’s Eve sounds very intriguing indeed! My sister and I both loved “Prophet” so I’d deffinitely like to read this one! Deffinitely sounds like the same genre. Thanks!